This compact module is pre-programmed with 18 effects, the brightness can be controlled at each mode - ideal for residential applications. 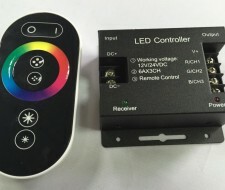 This easy to use touch wheel remote controller will operate either 12Vdc or 24Vdc RGB products. Its memory function will allow the last programme used before switching off to resume on powering up. Operates via radio frequency, the remote has a range of up to 20 metres. With 3 channels each with a capacity of 6 Amps it allows you to run up to 30m of our 60 LED/m RGB tape.